Magic Jelly in the Press! 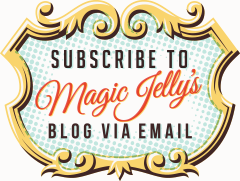 Magic Jelly has made a few media appearances lately, so I thought I'd tell you all about it! A couple of weeks ago, I was contacted by The Sunday Age, who featured my Li'l Mary drink coaster as their weekly Object of Desire. I was so excited & bought a whole stack of copies for my friends & family - yay! Later that day, my friend Mark slammed my fingers in the car door. Anti-yay. Thanks to Made It, my drink coasters also made an appearance in last week's edition of Central Magazine in Sydney (thank you to Bec from Made It for emailing me the pics!). Aaaaand...my coasters are featured in the April edition of Home Beautiful, which is very exciting indeedy! If that's not thrilling enough, one of my fellow Aus Etsy sellers, the fantastically talented artist Anna Laura, contacted me on Tuesday to let me know the lovely Jodie of Meringue (maker of the most fabulous wristlets) had spied my coasters on Channel 7's Morning Show as she was rushing out the door. Luckily, Melbourne's half an hour ahead of us, so I had about 5 minutes to spare just in time to tape it. If it wasn't for Jodie & Anna Laura I would never have known about it - thanks girls! Unfortunately, there's no video clip available to show you, but thanks to the wonders of modern technology, I have a couple of weird, fuzzy screenshots.